When one thinks of travelling around Australia, the wildlife and outdoors are the elements that first come to mind. I think it’s time that it should be known that Australia is also home to a lot of unique luxury travel experiences. I hope everyone had a lovely Australia Day yesterday! I know that Holy Smithereens has more overseas content than local ones (it’s my resolution every year to travel more locally!) but in honour of Australia Day, I thought I’d make a post highlighting luxury experiences around Australia. Last year, I created a list of road trips around Australia, so this year, it’s time to make a luxury list to experience in every state of Australia. I’ve experienced only one of these and the rest, let’s consider them as a wishlist of some sort. Uluru, or Ayers Rock is a massive sandstone rock formation located in the heart of the Northern Territory’s Red Centre desert. Believed to be about 700 million years old, it is sacred to the original inhabitants of Australia (indigenous Australians) and it is listed as a UNESCO World Heritage site. After a day of adventuring and exploration in the desert, you can have dinner by the stars in the middle of the desert. 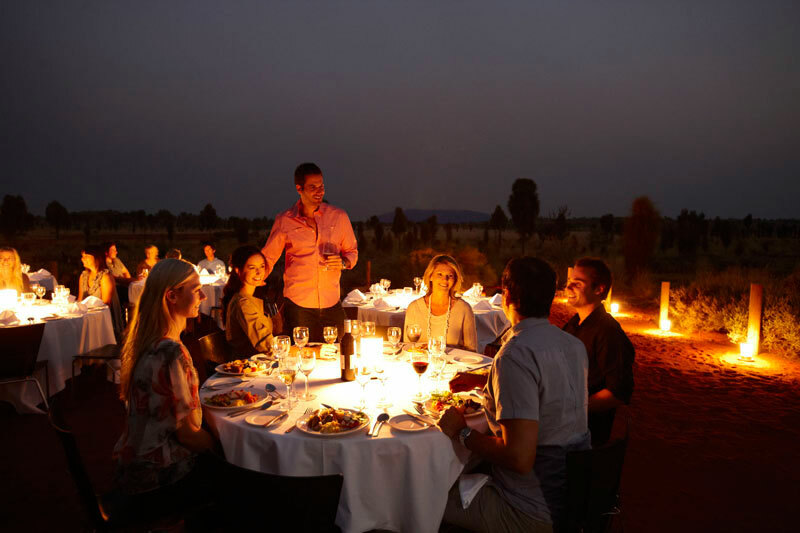 This is arranged by Ayers Rock Resort, and they call it the ‘Sound of Silence’ dinner. After dinner, they also have a resident astronomer who can show guests the Southern Cross, the signs of the Zodiac, and planets and galaxies that may be visible. Tropical Queensland is home to many resorts, but only few really make the world-class grade. 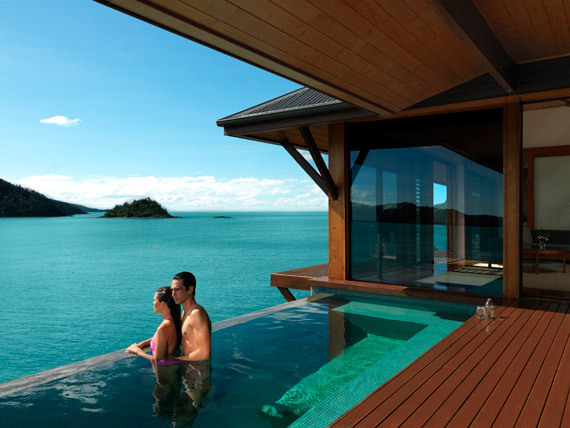 Qualia (pronounced ‘kwa-lee-ah’) is one to make the list. Part of US Conde Nast’s 2015 Traveller Gold List, and winning the title of Australia’s Best Resort as voted by UK Conde Nast Traveller readers. Byron Bay is located 772 kilometres north of Sydney. Known as the ‘style capital’ of the North Coast and Australia’s easternmost town, Byron Bay is endowed with both the coast and the mountains of the hinterland. It also has the perfect temperate weather, as it’s almost in the border of Queensland and New South Wales so it enjoys a year-round perfect weather that’s not too hot nor too dry or cold. Over the years, Byron Bay has become a haven for “urban refugees” that are seeking respite from the hustle and bustle of city life. With it’s alternative and “hippy” and healthy atmosphere, Byron Bay is home to many health spas and retreats. One such health resort that I was able to visit myself was Gaia Retreat and Spa, where I had a health pampering and re-start (both physically and mentally) for a weekend. I came back to the city refreshed with a new view in life and also knowledge on how to better care for myself. Just imagine how much more changed I could have been if I spent a week! Home to remote wilderness, sights, fresh air, great food and wine, Tasmania is slowly gaining more popularity as a tourist destination. Previously, the fact that Tasmania was ‘isolated’ from the rest of mainland Australia deterred tourists from coming. But now, it’s remoteness is part of the mystical appeal that brings increasing tourists into the ‘Apple Isle’. As such, there are now a number of luxury lodges and resorts that have opened in the last 5-10 years. Saffire Freycinet is one of those luxury resort/ lodging that offers both accommodation and unique experiences in your stay. Located mid-way along Tasmania’s coast, Saffire Freycinet is about 2.5 hours drive from Hobart, and roughly 2 hours drive from Launceston. Guests are offered authentic Tasmanian experiences such as having lunch at Saffire Freycinet’s own oyster farm, where you can wade knee-deep, gather and shuck oysters yourself while learning about the place’s marine ecology. The quirky capital of Victoria has so much hidden laneways and urban treasures that it leaves even its locals surprised from time to time. 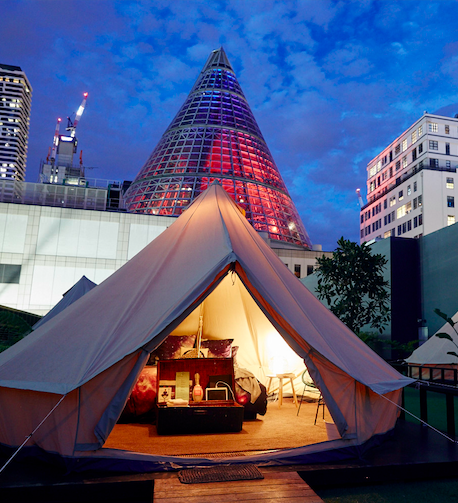 Living up to its reputation as a city that’s almost too hip to be true, Melbourne is now home to what would probably be Australia’s first “Urban Glamping” experience. Known for its exceptional food, wine and art, the most popular thing to do in Adelaide would be wine and food tours. But tucked just 20 minutes from Adelaide city centre is this fairy-tale looking Thorngrove Manor Hotel. A member of the Small Luxury Hotels of the World, Thorngrove Manor is very individual and romantic in that it gives a sudden medieval history (without being tacky) in Australia. I’m sure it is an interesting and strange feeling staying in a “castle” looking establishment given that Australia does not have any castles. Well this place definitely gives off a very European atmosphere because just a short drive away is Hahndorf, Australia’s oldest German settlement. While I reckon that this hotel may not appeal so much to overseas visitors (as one does not really visit Australia for…castles?? ), I can imagine this as a unique luxurious weekend getaway or staycation for locals and interstate travellers. This family owned zoo and wildlife lodge accommodation has definitely shaken Canberra’s image in a very good way. From museums to the Parliament House, Australians and overseas tourists alike now have another good reason to visit the country’s capital: to get up close and personal with wildlife. This unique African-inspired lodging are a first in the country, where one can ‘sleep with wildlife’. The lodgings are in the same area as the animals’ enclosures (separated by thick glass windows and walls). One can choose from giraffes, cheetas, lions, and sunbears as your desired “room mate”. The combination of animal encounters and opulent surroundings and lodging make this experience truly a luxurious and unique one. Occupying the entire Western third of Australia, Western Australia is the largest state in the country. The Kimberley is one of nine regions in Western Australia (northern most) and it has both the stunning north WA coast, and also rugged gorges and waterways. A cruise on the True North has long been regarded as one of the most wonderful ways to experience the Kimberley because it has been designed to access wilderness, to go where no other (bigger) ship can go. 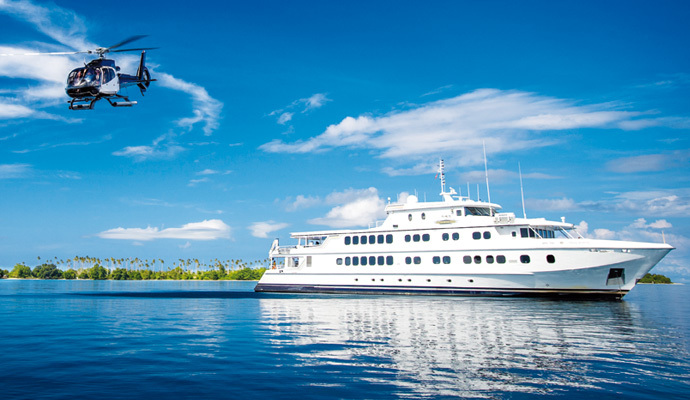 And unlike regular cruises, True North has enough tenders in the ship so every guest can separately go their own ways and adventures, no need to join group excursions. So there you go, my top luxury wish list experience in every state of Australia! Have you done any of the above experiences? Any other Aussie luxury experience that you may want to add to the list? I’ve done half of these and they were stunning. How did you find the Glamping? I did it in Jervis Bay and it was fun but I’d love to know what it is like in an urban setting. I absolutely LOVE the look of the glamping one! I’m still yet to make it down under so will have to keep that one in mind if and when I do. I agree about trying to make sure we see more locally as well as internationally – I am definitely guilty of not seeing enough of home here in England so for the last couple of years, I’m being sure to pencil in some UK breaks too. I need to hop on a plane and immediately get myself over to Saffire. That would be my number one on this list… but I’d love to do all of them honestly. I want to do ALL of the things, especially the zoo with a bear staring at me like I am dinner. 🙂 Glamping in the city looks crazy fun, I never even considered it to be a thing. 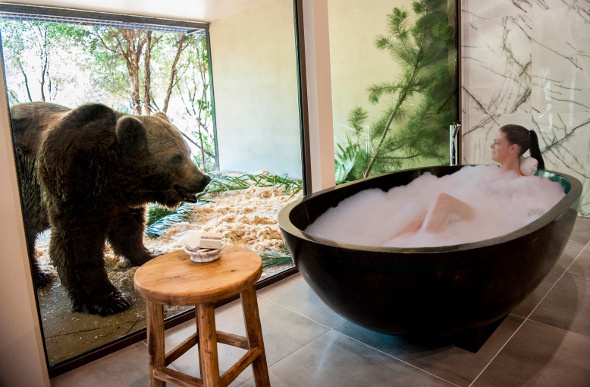 Haha yes..the bear staring at you like you’re dinner…and with you in the tub looking at the bear enticingly LOL. 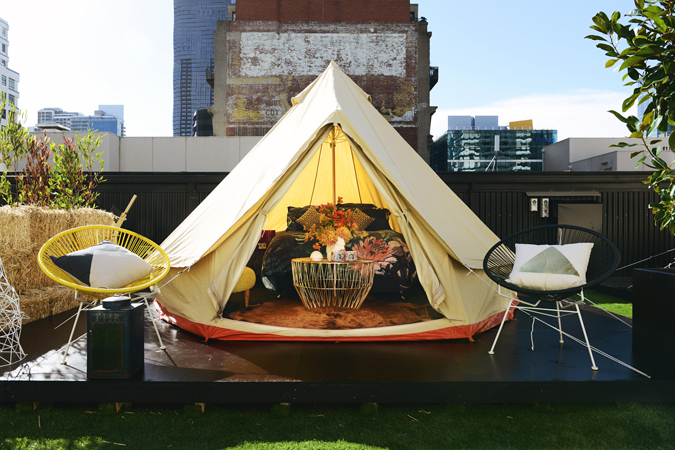 I really would like to experience the city glamping too! Wow that looks amazing!!!! I am leaving to aussie this year, can’t wait to check some of these places out! What an amazing list! The Jamala Wildlife Lodge seems particularly incredible. What’s also amazing is that this is my 4th time in Australia (my first time was living here for a year in Melbourne) and I still haven’t been to Canberra! !